This article is about the character. For the guest star, see Magic Johnson. Magic Johnson is a professional basketball player. He played for the Los Angeles Lakers. 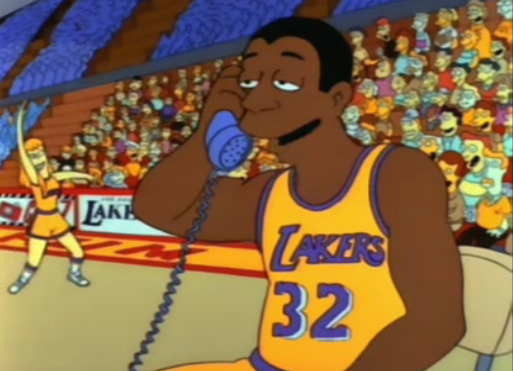 Magic Johnson rung up Homer to congratulate him on averting a nuclear disaster. Magic has a bad ankle and he is told he would be in great pain if he played on it and he said he didn't care. He tells Homer that people who aren't really heroes but are just lucky are soon exposed as the frauds they are. He later throws a slam dunk and slides near some cheerleaders and says that he pulled a Homer. Modified on December 15, 2014, at 04:39.